Coach Mark during Fran, one of his PB's the last week. I’m over the moon with my performance of the last week. It’s been incredible to take on each of these workouts and see my gains and feel how much better I can perform. I want to say a huge THANK YOU to our head coach and my friend Chris Oman who creates the programming for the classes I take and is the loudest voice on the sideline when I’m pushing through the last reps.
I’ve received really keen interest in how I’ve performed so well over the last week, and I though I’d reflect and share what I’ve done to help me achieve what I did. But let me first create some context. I’m married, and I cook. 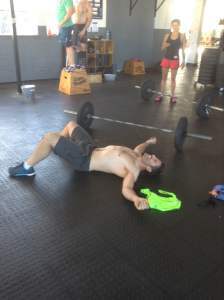 I train 3 - 4 days a week, doing the advanced class at Cape CrossFit. I work on my computer during the day, doing work for AMC Cookware and support work for my other roles. I coach 4 - 6 CrossFit class during the week at Cape CrossFit. 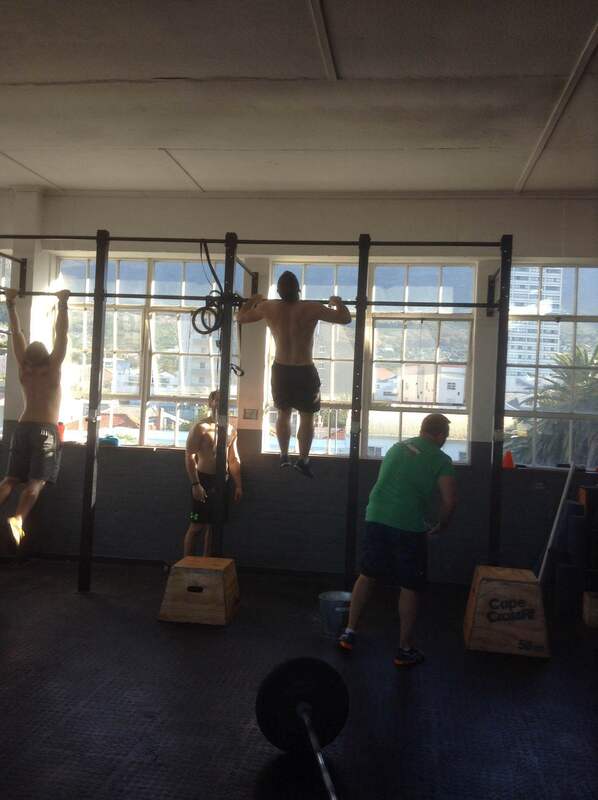 I do 20 min skill session coaching (nutrition, movement, goals, etc) for our athletes at Cape CrossFit. I am doing online health and nutrition coaching through my website www.thegameplancoach.com. As I sit now and reflect over the last few weeks leading up to this incredible week of performance I’ve had, two things stand out for me. One, I’ve worked on my mobility and weaknesses. And two, I’ve eaten really well. For a while now I’ve felt a sharp pain in the front of my right shoulder. This is most apparent when I reach up or press overhead. I rested it during the year for about two weeks. About three weeks ago I decided to start doing some extra work on my overhead position, after watching this video (thanks Jimmy!) and being inspired by this challenge (again, thanks Jimmy!). I started with 3x60s hanging and doing support work as in the first video, and now am doing 5 min of hanging with 3 x support work. It’s definitely a challenge but I’m certain that this has helped open my shoulders and create a better overhead position, despite my shoulder pain. I still feel pain, especially when I start hanging, but after some Voodoo flossing and shoulder pass throughs it feels a helluva lot better and I'm ready for action. Around the same time I also started working on core strength and handstand holds and have been doing a bodyline drill that taxes my entire core for a couple of minutes. It’s a great, quick routine you can do during your warm up or while you’re watching TV. Less TV, more warm up! I do handstand holds up against the wall, about 3 x 30 - 60 seconds. A strong core enables a solid foundation when performing movements like heavy lifting or gymnastics. I currently do my hanging throughout the day and accumulate my 5 minutes worth. 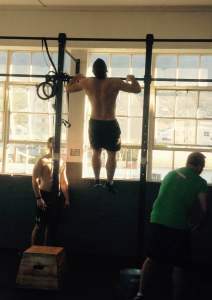 I use this kind of pull-up bar that fits into a doorway at home, or do it at the box before and during classes. I do my core work in the mornings or evenings depending on what’s been going on. Take stock of your weaknesses and where you mobility is limiting you. You can book a skill session with one of our coaches at Cape CrossFit who can help you identify where you may be lacking mobility and prescribe some exercises you can do to improve your positions. Or you can ask your coaches or Google for recommended exercises if you know your weakness. Make it easy. Who wants to add another thing to their to-do list? Nobody. So make it easy. You don’t need to get to the gym or need fancy equipment to do mobility. That’s why I have a pull-up bar at home - I see it and I do it. The bodyline drill needs a bit of floor space. My handstand work needs a wall. Make it easy. Do the work! Once you know what exercises you can do, schedule time in your calendar or before class to do the work and improve these positions that are limiting you. You won’t see changes overnight, but a few weeks worth of consistent stretching/movement will pay HUGE dividends in the future. I have a huge passion for nutrition and as a diabetic have gained a lot of experience on the different kinds of diets and foods and how they impact my body. The problem with being so passionate about this field, is that everyone has their own opinion! Every “fitness professional” has the best way to lose fat and sculpt your six pack abs. But in the weeks leading up to this last week I decided to stop listening to others and started taking my own advice, based on the principles I have studied at Precision Nutrition. I calculated my numbers and created an estimate of the amount and quality of food I would need for my weight and body type. This was more than I had been eating for a long time, and included more carbohydrates from non-inflammatory starchy sources like potatoes, rice and quinoa. Of course I was scared to gain weight! But I was adamant to cut out the noise and rather focus on the principles of my program. I ate nutrient dense foods that gave me all the macro and micronutrients to fuel my performance and keep me healthy. I avoided extra supplements like creatine and bcaa’s and added only one whey protein shake a day for convenience, and continued taking my fish oils and vitamin D. I had a couple of “cheat meals” but not much, and in the last week drank wine on only one occasion. Figure out what your health goals are and why they’re important. Nutrition plays a massive part in our lives and will directly impact the way you look, feel and perform. Meet with a coach to get some guidance on nutrition. The 20 minute skill sessions are ideal for you to ask questions you have to change course for your health. You can also read this resource I have created on Evernote that I share with my athletes. Get a coach. A coach can help you create awareness around where you are, where you want to be and help you with strategies to overcome the limiting factors that are holding you back. I am really passionate about nutrition and know that for most people they just want to be told “what to do”. But that’s not always as effective as actually creating habits that empower your choices and the life you create. That’s why I have recently created my site to offer online coaching to people who want to improve the way they look feel and perform. I hope what I’ve written here has inspired you in some way to take action and look forward to tackling 2015. What will you do make it your best year ever?